Located in the heart of downtown Fort Collins, the Mainline Ale House features delicious, southern influenced American food paired with locally grown ingredients and craft beer. Mainline Ale House has always held onto the tradition of bringing people together to share in community through the way of handcrafted beers. Everything Mainline does has a handcrafted influence, from making the food, to choosing the beer, to mixing the cocktails, the Mainline sources locally whenever it can. In this week’s community connections we got to find out what makes the Mainline Ale House so unique after sitting down with executive Chef Paul Schramm. I love the people that make up Fort Collins. There is such a diversity in age and I love creating food that everyone enjoys! For such a small town, there is a lot to get involved in and feel close to the community while still having a lot of stuff to do. I also love how close and easy it is to be in nature. Any free moment I get I love to be on the water, fishing and spending time with my daughters. 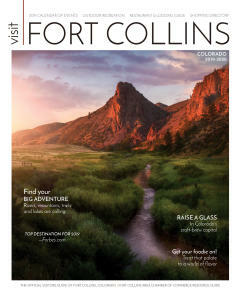 What are some of your favorite things to do in Fort Collins? I love networking – being out in the community and connecting with the people that make this town great. I am also very active. I am a part of a rec softball league, I go bowling every week, I love to kayak and fish in the summer months, and hiking at Horsetooth. What makes The Mainline Ale House unique? The Mainline is a great mixture of diversity and locality. We provide tons of local beers, always rotating with fresh options for pairing with our locally sourced food. My style is American temporary but I try to keep it exciting with different ethnic infusions and twists. The Mainline also offers amazing food at an amazing price. We are able to bring families in with affordable prices, but also provide fresh and delicious dishes. I also love how close our staff is – we all work as a team to create the best dining experience for our guests. What do you want visitors to experience at The Mainline Ale House? I want each and every visitor to experience great food combined with a great atmosphere. I want them to take something with them from their experience that they will reflect on the next day, and feel inspired – like my Grandma did for me. I am honored to be a Chef in this town, not only to make food but also to give my employees a chance to be part of a great team and feel like they are contributing to making Fort Collins a wonderful place to live. I was born in Phoenix, Ariz., and grew up on the baseball diamond. I spent every minute of my childhood outside either throwing a baseball with my friends and team, or tubing down the river. I remember coming home after a long day of practice being met by the smells in my kitchen my grandma was creating. She is my inspiration in every dish. Her food always left me feeling so great and increasingly inspired. I always wanted to be able to recreate this experience for others. I started my family early in life, so I shifted my focus from baseball to a culinary career. I have worked for and alongside a number of amazing chefs who have helped propel me into a passionate career that I still find exciting and meaningful. I work hard every day to provide for my two beautiful daughters who share my passion in the kitchen. If I don’t watch my back they make take my job someday! Address: 125 S. College Ave.